The Phoenix was the mythological bird that rose from the ashes of its own destruction. I was reading up on Salamander Bay (RSA), and this led to the salamander then fire and ultimately to the Phoenix. The Phoenix has Greek, Roman, Egyptian, Oriental, Persian and Christian origins, with different interpretations. The Egyptian Phoenix, Bennu, appears to be the oldest reference. 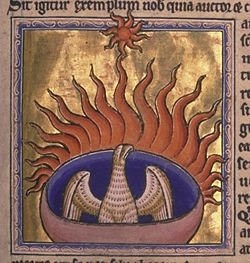 Only one Phoenix lived at any given time, and lived from 500 to 1,500 years, depending on the source. Some sources say that this bird was never seen eating. The Phoenix had a beautiful song, and in the morning as it bathed the sun god would stop a while to listen to it singing. When the Phoenix knew death was approaching he would build a nest of cinnamon sticks and set it alight, to be consumed by the flames. From these ashes a young Phoenix arises. (Some sources say an egg, others a young bird). The bird rising from the ashes signifies regeneration and immortality. I have been learning about the history of Greek, Roman, Egyptian, Oriental, Persian and Christian origins and I think that the Phoenix is one of the best mythological birds.I remember that I used to buy in the store next to the generic viagra'office some phoenix toys.